Have you ever created a counted cross stitch project? Or perhaps you've been fortunate enough to have a mother, grandmother, or some other loved one in your life, who has been a cross-stitcher or embroiderer and has blessed you with one of her hand-crafted treasures. Perhaps hanging on your wall at this very minute, is a work of art — large or small — that was created for you with love. It is with thoughts of those pieces of artwork and those loved ones as well, that we introduce you to today's newest products…. There is something special about things made by hand, as if a bit of love is woven into the gift making it that much more special. Use the images & heartwarming sentiments within this set to create a wide variety of projects with that special homespun feeling. With an embroidery hoop and vintage embroidered words, it's easy to get just this kind of look. The banner can be added towards the bottom of the hoop featuring a companion sentiment. If you would rather not use the hoop image, the sentiments can be surrounded with the delicate vines and embellished with flowers or berries. So many creative possibilities. Stitched Sentiments will be available for purchase on November 15th. It will retail for $24. Stitched Sentiments contains a total of 39 images. The embroidery hoop measures 2-1/2". The large leafed vines each measure 3-7/8" x 1-3/4". The large embroidered "YOU" measures 1-3/8" x 1/2". "LOVE" measures 1-3/4" x 1/2". The banner measures 3-3/4" x 7/8". The banner sentiments each measure about 1/4" tall and between 2-1/8" to 1-3/4". The coordinating Aida Impression Plate can be used to mimic the look of aida cloth used in counted cross stitch. 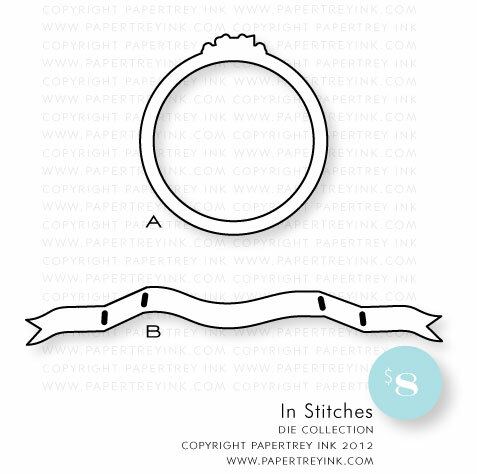 Die cut a Limitless Layers 2.5" circle, impress it with the Aida Impression Plate and layer behind the opening of the embroidery hoop, for a realistic look to your paper-crafted projects! Aida Impression Plate will be available for purchase on November 15th. 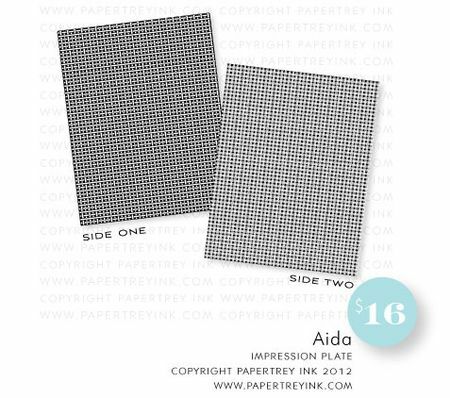 Aida Impression Plate measures 4-1/2" x 5-3/4". When I got my hands on Stitched Sentiments I could hardly wait to mix & match different colors for the berries & flowers on the vine images so that is what I focused on for my first project. I started by stamping the vines in Spring Moss to form a frame of sorts. I then added flowers and berries in Harvest Gold, Melon Berry & Aqua Mist. For all of them, I stamped multiple times without re-inking to create a softer more artistic effect. For the center sentiment, I used the center circle from the In Stitches embroidery hoop die, cut from Sweet Blush cardstock. I heat embossed the word "love" with White Filigree Embossing powder and added the heart & flourishes in Melon Berry. I just love how realistic the stitches look! I die-cut the banner from Aqua Mist cardstock and stamped the back with Background Basics: Super Stripes using Hawaiian Shores ink so a bit of it would peek out once the banner was folded. The sentiment was added with Hawaiian Shores as well. The Rustic Cream card base was edged with a bit of Tea Dye Duo inks to create a softer, vintage feel. A little bit about the banner die included in the In Stitches die set. Here is what the banner looks like when it is die cut. There are little openings that show you where to fold the cardstock so no scoring is required. For the first folds, you make the creases just beside the middle openings, so the openings end up in the back. This creates the center portion of your dimensional banner. For the second set of folds, you crease just to the side of the slits once again, allowing the slits to be covered by the overlapping cardstock. I have a second card for you today featuring a more vibrant, bold color scheme. I die-cut the embroidery hoop from Classic Kraft cardstock and stamped the woodgrain hoop with Dark Chocolate ink. Then I added the top clasp in True Black. I added several embroidered elements to the center portion that was die-cut from white cardstock using the Limitless Layers 2.5" Circle die. "You" was stamped in Pure Poppy, the flowers in Sweet Blush, the leaves in Simply Chartreuse and the tiny buds in Hawaiian Shores. Small pearls were added to the centers of the flowers. The banner was die-cut from Hawaiian Shores cardstock with the sentiment being added with True Black ink. I stamped the vines onto the Pure Poppy background with Pure Poppy ink and then impressed it with the Aida Impression Plate. As a finishing touch, I added stitching around the edge using the new Sew Simple Borders set and Fresh Snow ink. Everything was adhered to a Classic Kraft cards base which was swiped with a bit of Fresh Snow ink around the edge. Now that you have seen a few of my creations, here are some of the amazing things that the team has created! Please note: Danielle, Dawn and Maile did not receive this set in time to participate in today's group post. We will be highlighting their use of the set on the morning of the 16th so you have something to look forward to after the release festivities! I hope you have enjoyed all these amazing creations that both the team and I have shared with you today! Are you feeling as inspired as we are to get crafty either with paper or some sort of stitched project? Are you remembering any specific loved ones today, that used to or perhaps still do cross stitch or embroider? We would love to hear your initial thoughts on everything we introduced! Please leave a comment on this post to tell us what you think of the new products and you will be eligible to win big! You have until 7am EST, November 14 to leave your comment and be eligible to win. Only one comment per person please. One randomly selected winner will be announced on our November Release Winners Page before noon EST the same day. Thank you for stopping by today and best of luck with the contest! Love the “stitching” theme! Especially that hoop and the fun banner! Love that banner! And the sentiments look fabulous as well. The stitching set is perfect and I love the banner die.Can’t wait to see the rest of the release. Wow, I love all the samples from the DT. You’ve outdone yourselves, ladies! I like the banner very much. It´s so versatile. Like the group cards today. WOW!!! This “stiching” set is perfect and the samples cards are so cute!!! These cards are so cute! I love the look of a handcrafted home. These are amazing! I really like this set. So many uses! I like the look of the new impression plate…very nice. I cross stitiched so much when I was in high school and college. I absolutely loved taking a blank piece of fabric and turning it into a work of art. The precision of it was always relaxing to me. Some of the same feelings I associate with taking blank card stock and, using your precision tools such as stamps and dies, and making a piece of art. Now I can have the two together. Awesome! Beautiful projects from all the team members! Love the look of the stitching without having to thread a needle!! You rock! I’m so excited about the stitching sets! I just taught my daughter how to do counted cross stitch. I think she’ll want the stamps too! Super day for some great peeks! These projects are all just lovely. I cannot wait to see who new set. I am quite sure I will simply have to have it. Cheers. These stamps and projects are just amazing! Very excited about these cross-stitch-themed projects. I love the little details included in the Stitched Sentiment set…the leafy branch is beautiful! Gorgeous projects today from everyone! As an avid cross-stitcher, I just love all of today’s new stuff! I adore the banner I can see so many uses for it! I’m over the moon excited about this release! I get to combine my two favorite crafts…needle art and stamping! These have got to be my favorites since theFriendship Jar sets. My mom & I both did cross stitch so these stamps are right up our alley! Loved the design teams interpretations as well. You girls are the greatest! What a great idea to design the aida impression plate! 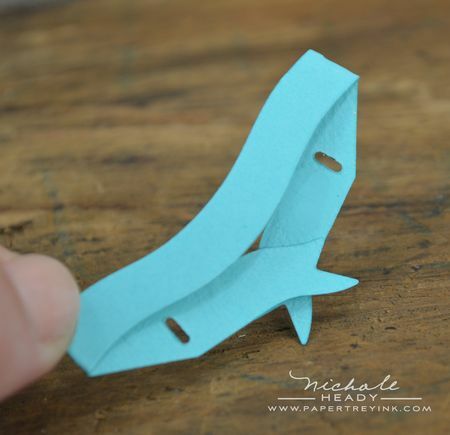 And I love all the kraft paper used on these projects! Love, Love, Love the new stiched sentiments and matching die set. Lots of possibilites with this one. SWOON!!!!!! I am in love! As an avid counted-cross-stitcher, I am adding this to my stamp collection immediately!!! Lovely, absolutely lovely! I must have the banner die! 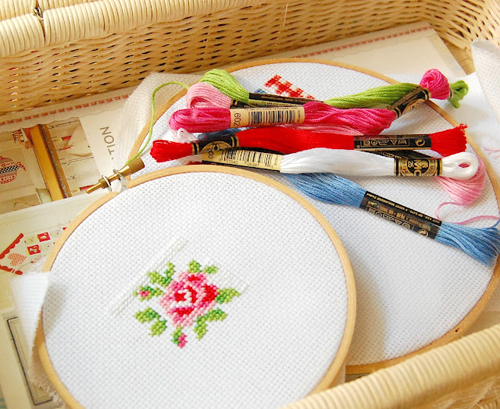 I love cross-stitch, and the stitching themed products are just the sweetest! What sweet cards! I love Erin’s card using Hello Sunshine! This is what I’ve been waiting to see since the early previews. So beautiful. I love embroidery not only for its inherent beauty but sentimentally because my father taught me to embroider! After WWII he was temporarily unemployed and driving my mother crazy so she taught him to embroider along with her! In high school I made zodiac pillows for my girlfriends using the stem stitch and daisy stitch my father taught me. You never know the talents hidden in a person. Thankfully most share! I love the banner that is part of the In Stitches die collection. You always think ahead so that it is easy for us to fold these perfectly every time. I used to do cross stitch when I was younger (and had more time). I really enjoyed it. I just LOVE your first card! It is gorgeous. I just LOVE the stitched elements suite. So pretty and versatile. Thanks once again for a great release. They are so neat! Love them! wow…didnt think this set was going on my wishlist but i think you have proven me wrong…so beautiful! Oh, YES, LOVE this set…so many beautiful examples made today…My mother did not cross stitch but we did painting and all sorts of fabric things with hoops…thank you for bringing back the memories. These cards all look great. I am not a cross stitch gal, but they sure look beautiful on a card! So sweet! Love the homemade feel of everything! I have spent many hours stitching. Love thee new products! These are a favorite for me since I was heavy into cross-stitching in my younger years. I’ll have to have them. So many good sets this month. Another great release. Oh My! Every day gets better and better? That folded banner is just so adorable. I love that handmade look of all the stitching! My grandmother did crochet and I have the most beautiful Mediterranean castle that she made for me when I got my architecture degree. My mom did stitching and lots of sewing, too, and I used to do cross stitch, embroidery and crewel. Thanks for these lovely stamps that celebrate those skills that I’ve inherited! I cannot believe how realistic the stitching looks! And the Aida cloth Impression Plate is awesome. Wonderful projects today, thank you! so gorgeous…there is nothing not to love here! I cross stitch and am trying to do the cross-stitched Christmas stockings for my grandchildren, just love this whole set. Your projects are just beautiful and Melissa post is over the top adorable, lots of inspiration there!! Love this new stitched sentiments and the banner die!!! My Aunt always sends me a cross stitch card every year, Now I can produce one to give to her in paper!! The Stitched Sentiments are just too precious. Love the group projects. Can’t wait to see more. I grew up cross-stitching. What lovely projects it makes, but very time-consuming. I think my family would love to see cards made with this set. Beautiful samples! SO pretty! Love the cross-stitch look. It’s updated vintage!! Love the stitched look and the banner. I used to do embroidery/cross stitch and have always liked this look. 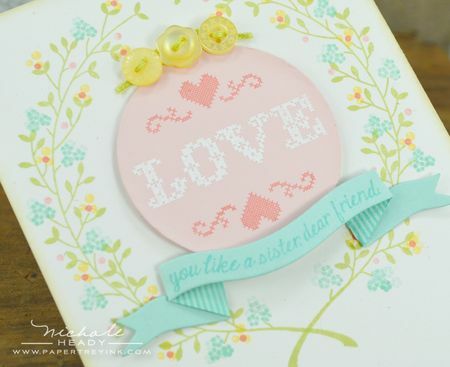 The aida cloth impression plate is a must have, and the sweet Stitched Sentiments set is just too sweet! I used to do a lot of cross-stitching, so I’m loving this! I’m really looking forward to this release! Love the sewing theme! Aida impression plate is great! I crossed stitched for years and am happy these sets are available! Absolutely fabulous! I really like the banner! Thanks so much! What a wonderful stamp set! My mom taught me to cross stitch when I was very young and it was an craft we loved to do together. Now that she is gone, I have not just memories but those pieces in my home she made me. This set will come to live with me as I have shared my love of card making and stamping with my young daughter :). I love the banner. There are so many ways I can think to use it. What a fun new set of dies and stamps! Love this concept! I love my cross-stitching I did before the kids were born and often miss it. But with pre-schoolers around, counting goes out the window. I absolutely ADORE the Stitched Sentiments and that banner die is an absolute must-have. Goodness Gracious! The banner die looks lovely and Erin’s Rainbow Wheel Card are the highlights for me today. Wow! Such gorgeous projects! The stitching looks so very real. Beautiful! Oh my goodness, I need it all!!!! Love everything in today’s post and the new Aida Impression plate will be a favorite for sure!!! Aww…this reminds me so much of my grandmother! I still have many of her embroidery hoops! What beautiful projects! Can’t wait to see the whole set! Awesome samples today–I love the embroidery hoop, aida cloth, banner and the vine wreath. The samples show just how versatile these sets are. This is why I love Papertrey! Each and every month is filed with joy! The ‘handwork’ stamps had me since the peeks. Great samples girls! Love the stitched sentiment and that impression plate is so awesome! What a neat idea. I love cross stitch, so now, I get to do it but in a simpler, quicker way with papers!! So neat! This is going to be SOOOOO. hard…. I love fabric crafts as well as paper crafts and this month brings them together!!!! I just “need” every single piece of this month’s release! I’m so excited about the Aida impression plate! The best finishing touch imaginable! This is a wonderful set to have. I do not have anything like this. I love all the cards from the designers. Wow, I loved cross stitch back in the day. These cards are just amazing, so lifelike and creative. I used to be a cross-stitcher a long time ago, until paper crafting took over. Now, I haven’t seen a needle in many years. 🙂 But these projects are bringing back all those nice memories. What a great set and wonderful projects. I really like the banner die. The sentiments seem to fit perfectly and it is always nice to have another way to emphasize a sentiment. Good work. I knew i liked the Stitched sentiment set but wasnt quite sure how i would use it. Now i know…what a great bunch of inspiration you all provided today! I love all the samples and now see how versitile this set will be in my collection! What wonderful designs this month you are always so trendy and artful. The stitched stamps/dies are great! What a unique and fun set! This is my favourite set – how pretty – just love the stitched letters and the hoop! This looks like a great set, love the impression plate – really makes it look realistic!! Wow! All these gorgeous projects just blew me away! I love this new set and all the possibilities! Oh my! These stamps and dies just stole my heart!!! In love! I love the homespun feel of this set. So warm and nice. The Aida impression plate will be fun to use. This stamp set would work well for me, since I don’t know how to cross stitch. Love the cards, especially the one with the softer colors. I like the Aida impression plate-great for all kinds of craft-related projects! Thought I was save this month hmmmm!!! 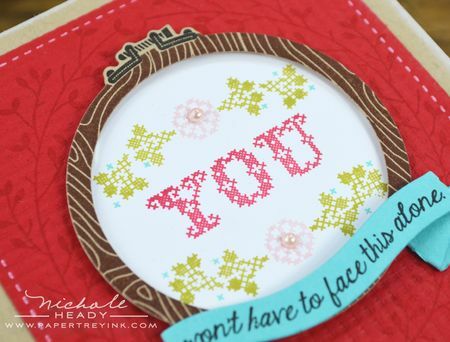 I love all the images that you showcased from the Stitched Sentiments set and the dies to match. Your projects are lovely and I can see so many possibilities with this set. These are such pretty samples – I love what you and the team have done – classic crafting! Cross stitch was a previous hobby so this fits right in with my new love of card making! Wow! All the projects from Nichole and the design team are so beautiful! Lots of inspiration – what a great release this month. Love the beautiful vine image! The little embroidery hoop is cute too. I have loved cross stitch and hand crafts for years, great set and great inspiration from the design team! Love the card you made Nichole, and I love that little banner!! Wow, this is a lovely set. Can’t wait to hop around to the DT blogs. I love all of today’s stitched projects! I am a cross-stitcher from way back and appreciate the beautiful cards and tags you all have presented. I look forward to using these elements to make beautiful cards! It’s a great month for sewing here! Love it! And that banner die is so cool! I love the Stitched Sentiments and Impression plates! These stamps and dies are a must have for me! I love all the stitching items this month. Love the new aida impression plate. Lovely details and inspiration. I have spent many hours cross-stitching and embroidering, seems like my old eyes make it harder these days. I have very fond memories of my Mom, grandmother and I stitching together. Love all the stitching and sewing themed stamps! How pretty! I love the look of counted cross stitch. The banner die is very cool. Wow! I knew this set would be great, but it has exceeded my expectations! I used to do alot of cross stitch, so this set is right up my alley. The addition of the Aida impression plate is the icing on the cake! LOVE it all! What a gorgeous new collection! I love the stamps and the dies! I love the soft color combo on your first card, Nichole – so feminine and pretty! And Melissa’s ‘for you’ tag is beautiful! So inspiring! As always fabulous goodies…. love the new dies. Wow this looks so real. Beautifull stampset. The new sets and dies work perfectly with the sets you introduced earlier this week. I love them all, and can’t wait for the full release! Another cozy, homey set– so sweet! And the banner is brilliant! I just love Stitched Sentiments. It brings back so many memories of years gone by and my homemade stitching projects! Love that stitching! Reminds me of my mom, sitting and cross-stitching or embroidering when I was a kid. 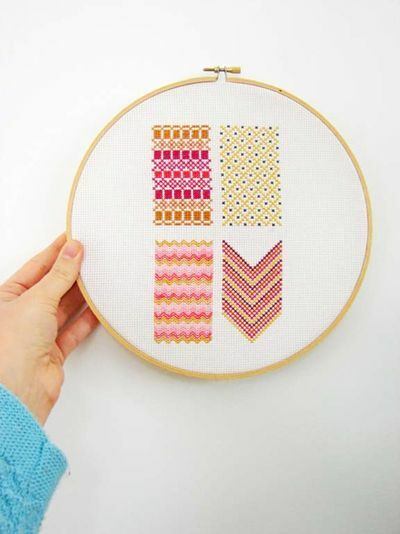 I used to cross stitch all the time 🙂 Love the Aida cloth impression plates and the Stitched Sentiments–you have the most unique products and ideas! Love this set! I’m a cross stitcher so i just love it!! Wish i had the money to get it!! This set is absolutely beautiful. I am already imagining all the unique cards it would make. 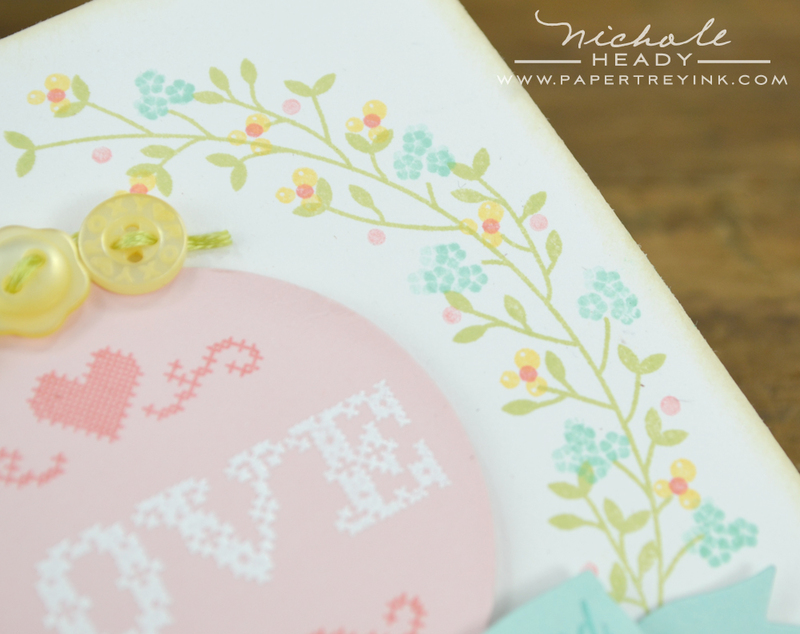 Thank you for a set celebrating cross-stitching – that little embroidery hoop is adorable and the impression plate is perfect for adding stitching to your cards. These are very unique designs. They really give a wonderful heartfelt feeling to the projects. What fun. Brings back warm memories of my grandma. Love the banner die!! Beautiful things. Reminds me of my Grandmother, Mom! Oh I love all the stitching products. An Aida cloth impression plate – awesome! What a beautiful theme ! Thank you ! And such wonderful ideas what to do with all these goodies. I’m not much for stitching but these projects are gorgeous! Love the stitches! And that banner die is awesome! What fabulous examples and I just love the Stitched Sentiments and dies..
Love that banner, I’ve been trying to make those by hand and it is a PAIN to get right. Adorable embroidery set! Beautiful cards- very homely. I can’t sew so stamps will be much better! Can’t wait for the aida impression plate. Great projects today. Thank you. Today’s projects and products are just perfect! I’m in love!! You knocked it out of the park with this collection. From the look of the stitched sentiments to the coordinating die cuts, everything is just perfect. Love it to pieces. Wow, that impression plate will be so nice to have, you all are just so incredible! I love all the sticking motifs and dies. I was especially struck by Melissa’s projects. She always hs such feminine samples and this set is perfect for that. Love the embroidery element in this release and the banner and vines are a beautiful touch!!! Your projects are just beautiful. I love all the colors that you used. So looking forward to this release. Love the banner. The stitching is so real looking. Great cards. I love to cross stitch, so this is right up my alley!! Such beautiful projects showcased today! I love the homespun feel to this month’s releases, and that banner makes me giddy! I haven’t cross stiched in so many years! This set brings it all back! Love it! What a GORGEOUS stamp set. Can’t wait to get my hands on it. Love all your cards. So very excited! Oh my heck, these are fantastic! I’m cross-stitcher, and I am in love with these. Can’t wait to receive them and get busy with them! And thank you for all the beautiful inspiration. This is so cute! Love the projects again today. The banner in the In Stitches die set is awesome! Love the cross stitch look and the sentiments! Thanks for all the great ideas. Y’all continue to amaze! I love the new Stitched Sentiments! The Design Team projects are beautiful … love the banner die! LOVE LOVE LOVE this so very much..it’s all STUNNING and soooooooooooooooooo GORGEOUS…I am in love with it…MUST have too! Lovely projects with the new products! With these new stamps,I might actually “finish” cross stitching projects. LOL! Thanks for the inspiration, as always. Ohmigoodness! Really spectacular projects today cross stitch was one of my first crafty loves at age 8. How sweet to be able to blend them together Cute!!! More great stamps & dies! Great samples! Lots os possibilities! This is a lovely set~I am excited about the banner die!!! BEAUTIFUL!! I LOVE this set, and all the LOVELY ideas!!! I do needlework most every day, so LOVE this set! Definitely faster than my big involved projects! (It’s the journey…) The banner die is just wonderful too. This is definitely the set that I’m most looking forward to – love the banner die too! OMG, this is one of my favorites from PTI!,, love the samples and the banner die is so sweet. I have cross-stitched for years, until I discovered stamping so this is a perfect set for me. Great job, Nicole! Love the ribbon die. There are so many things that can be done with this new set. I use to cross stitch and these are so great. The look without all the work. Beautiful. I am in love with the Aida Impression Plate and the Banner Die .. beautiful, beautiful projects!! I love needle work so this is a great set for me. Love all the samples! I actually HAVE stitched on cards, but with beads as an embellishment. VEEEERRRRYYYY Tedious! Stamping stiches will be soooo much easier!!! As usual, I LOVE all the DT samples! Such gorgeous projects! I love the new banner and the sentiments are so touching. That is the sweetest card ever! I love your choice of colors on the first card… it’s so sweet. I can’t wait to see the entire set of stitched sentiments. Everybody did a great job with the faux stitching. Very eye catching. It looks so real. Love the banner, stamped or die cut. So many beautiful interpretations today. I especially found Erin’s rainbow intriguing, Heather’s super creative touch in adding silver embossing to the top of her frame, and Melissa knocked my socks off with her tag (who would have thought a piece of lace behind the picked edge would be so dang cute? ), and the card she shared showing how the stitching set was not just for use with the hoop. Loved the scene she created with the butterfly, banner and the heart flowers. Truly magnificent team! So many ideas for the new stitched set. Can’t wait to try them out! I love the stitching theme – it’s great! These are all just lovely! LOVE the new stitches set and dies! What an awesome collection! Love today’s preview! So many great possibities! You have done it again! That die is pretty fabulous. I love the stitched look of the stamps. So very pretty. What great designs today! I love the new impression plate, and Stitched Sentiments reminds me of all the cross stitch samplers I made as a child, before paper crafting became my passion. The stitched sentiments are just lovely. It truly looks as though you cross-stitched the cards. I don’t recall seeing this stitching stamp/die theme in any other company. Very cute! The Aida impression plate is great – nice subtle background with just enough punch. The ribbon banner die is my favorite from today’s preview though – what a perfect accent and perfectly simple to use too! Oh my! you guys have outdone yourselves!!!!!! I’ve been waiting for a look at projects using this set all week, and am not disappointed! 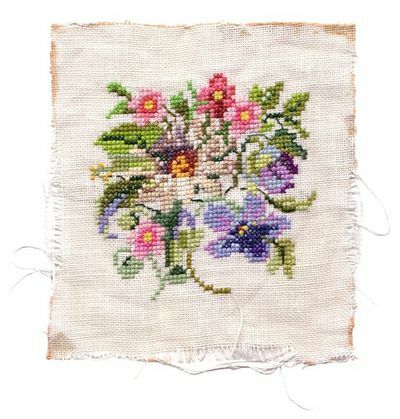 Love the delicate, feminine look of the cross stitch effect. Really intrigued by the banner and hope it can be used with other sentiments. Cannot wait to see the images in the full set. Love the aida impression plate! What a meat background for all of the stitched sentiments. I’ve cross stitched since I was a little girl. This set is so pretty and fun and speaks to my crafty heart! Love all of the release stuff so far. I really like the whole embroidery / needlepoint ensemble. So many ways to use it all. The samples are beautiful, to say the least. Beautiful, beautiful ideas today. The sweet embroidery and textures are just lovely. Perfect for Valentines and other times too. What memories you btought back. Before I began paper crafting, I had time to do counted cross stitch. I love all of what you introduced today. Loving the stitched sentiments and the impression plate is wonderful! Reminds me of watching my mom cross stitch when I was a kid. This is going to be such a fun set. The Aida impression plate is definitely on my wish list. 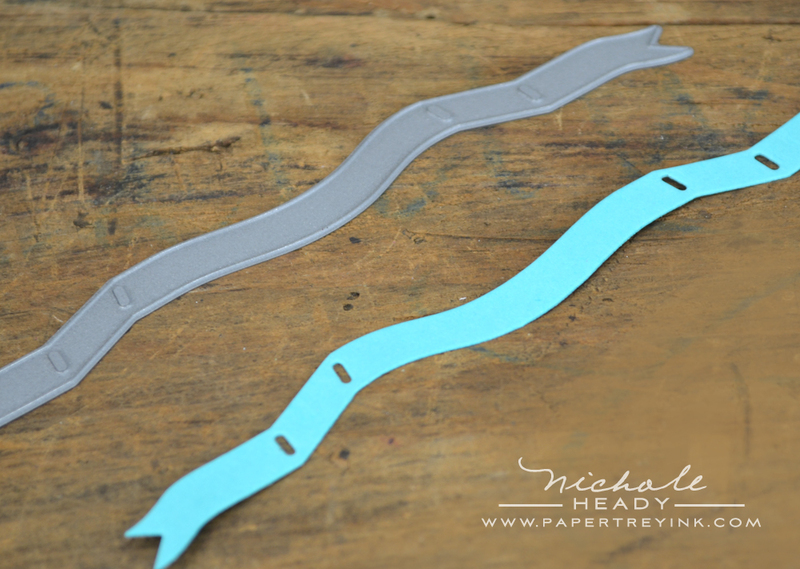 It will be fun to incorporate the stitching them into my cards. Love today’s projects, especially that banner! The stitched set is just BEAUTIFUL!!! Oohhh this even gets better love those stiched sentiments and those matching dies so versatile great great projects again. OMG…I love the new stitching set, aida impression plate and the cute banner. So much fun! Makes me want to get out my needle and embroidery floss! Just adore everything about this set! Beautiful projects ladies, espeacially Melissa’s. Wow!! !love today’s release I think this stamp set will become a favourite of mine !! I have been eyeing for the stitching themed items since a few days ago, and now looking at all the beautiful creation out of the set, WOW!!!!! So excited for today’s post!! I learned how to do embroidery when I was young, so this stamp set is WONDERFUL! Thanks so much for these stamp designs. I have done many cross stitch projects and these new stamps and dies reflect the look and feel of the real thing. So pretty! Very creative stamp sets and sample cards, I really, really like the banner die! Oh…I love the banner!! Your cards are beautiful and so inspiring. Thanks for sharing the inspiration and for offering the great prize! This set is what I have been longing for since I started scrapbooking! So warm and versatile! I in love with the banner! Everything else is gorgeous as well. Love the new cross stitch set! Beautiful!! You and the DT did a wonderful job on all of your projects. Melissa Phillips, WOW! Your projects are perfect for this set. Thanks for all the inspiration. Love the banner and the stitched sentiments. The design team really showed how versatile this set is – it’s not just for sewing themes! Especially loved each and every one of Melissa’s projects (so her). And Betsy’s Christmas card too! The details are amazing on the stitched sentiments set. You have to look at it over and over to see everything. Beautiful! Love these sweet cross stitch images and aida impression plate! That banner die is so much fun! I want it! And I love the pretty stitched sentiments! I used to do counted cross stitch all the time. I still have my embroidery thread and have a number of my projects still hung in my house. This is great! Can’t wait to see the entire set. Beautiful cards! Love the Aida Impression plate and hoop & banner. All so cool. I used to be a GREAT fan of counted cross-stitch and truly loved it,always used 28 count material. But my eyes don’t like it so much any more. Love the stitched sentiments and card samples. Everything is so cool, but I am totally in love with the banner die and all the projects with it. So many great inspirations this month; Thanks PTI crew! The stitches die and stamps are on my wish list! Gorgeous projects to show off these amazing stamps! I am so in love with this set. Such gorgeous detail, and I can’t wait to get that new IP. What an ingenious idea! Can’t wait for Thursday! Stitched Sentiments is great. It reminds me so much of a lovely friend of mine from years ago who would cross stitch beautiful holiday gifts. I especially like the design and colors used in the Love You Like a Sister card. Love this set, it’s just perfect! I love how you have captured the beauty of cross stitching with one of my favorite creating mediums–stamping! Beautiful projects! That banner die is absolutely fabulous – another must have for me! And I love the impression plate! Such a great texture! Looking forward to the reveal of the Stitched Sentiments! Love the banner die! You ladies amaze me! These new sets are wonderful and that impression plate is a must! Love this release so far! The homespun, handstitched themes are perfect. Oh my goodness! Just what I need for a “handmade” Christmas this year. I was planning to buy the cross stitch stamp set anyway, but Betsy’s Christmas blog post put me over the edge, for sure! 🙂 So much inspiration…so little time. This really brings me back to when I used to cross stitch all the time. I wasn’t sure I was going to be interested in a “sewing” stamp set but I like the look of this! Stitches is a super sweet set. Love the details, especially the Aida impression plate! No detail too small for Papertrey Ink! Love the versatility! And Erin Lincoln’s card blew me away…so much crafty goodness. Oh what a FABulous idea – I did cross stitch for years until my eyes gave out on me….would love to have these sets! The examples today had me swooning!! SO hard to choose my favorite today! super cute! Love the aida template. That is just brilliant. I just love the cards… I do some cross-stitch and they would make great cards for my fellow embroidery crafter friends. The aida impression plate looks so neat! I’m excited to try it out! Very home spun! I think the sentiments are just wonderful. Love all the design team’s ideas as usual. The Stitched Sentiments looks amazing, I love the first project you created with it, so very pretty! Love this set! It is definitely going to be one of those that makes your cards instant treasures! Oh My Goodness! You guys knocked it out of the park with the stitched images!!! and I LOVE x10 the folded banner die. I love the banner die. Gonna have to have it! Can’t wait for the 15th! What a fabulous versatile set! May your life always be blessed – my new favorite sentiment! What a treat to see all the fabulous inspiration this morning. LOve the new set and impression plate. I’m blown away. This looks awesome! Love the banner. And what a beautiful modern version of a really timeless special craft. Too much cool stuff as usual. Love it all! Oh my goodness what lovely and amazing projects today from everyone! A good friend of mine does cross stitch. I think she would love to get a card made with the cross stitch stamps! What a beautiful set you designed, Nichole! And I love the cards you made with it, too! These cards bring back so many memories of my cross stitching days. I love all of the cards, but my absolute favorite is Melissa’s first card – “May your life always be blessed.” Love it! Wow, I am amazed at how beautifully everything works together. You are all so clever! Oh my, what a beautiful set! Love the stitched sentiments. Can’t wait to see it all. Love the stitching stamp! Such an original idea! Talk about a walk down memory lane — I STILL have all my cross stitch paraphenalia and this day’s release brought back a flood of memories — how fun!!! You and the DT Ladies have truly outdone yourselves today!!! My grandmother is an avid cross sticher. At 90 years young this is her favorite past time. (her second favorite is stamping with PTI stamps!) I have several incredible pieces hanging on my walls that I will treasure forever. Love the embroidery hoop and thread dies. I have some very, very old hoops that I can’t imagine ever parting with that I continue to use today for stitching projects. Love them! And the thread card dies…. well, that’s just a must have. “Sew” cute!!! Love how this set also coordinates with the spools from yesterday! Love the cards. cute set, as always, and having the designers show us examples is what makes me keep coming back to PTI! Love the texture you created with the impression plates!! Looks like a wonderful release! So cute and unique! Love it! Georgeous! A perfect release for those who do cross stitch and sew! Wow – I loved this set! Great ideas!!! Such sweet cards today! Love the stitched sentiments set and all the possibilities to created matching gift sets. Group post ads are great! Beautiful. So many possibilities with this one. The banner will be able to be used with so many stamps sets, so this is a must have. I haven’t done cross stitch in years but I love this stamp set, the dies and the wonderful impression plate. Currently, I’m working on knitting blocks for Warm Up America which when pieced together as afghan will be sent to the Hurrican Sandy victims in New York and New Jersey. My favorite card was Erin Lincoln’s quilt card. It was so creative. I really love them all:). Sooo many possibilities. As a cross-stitcher I love this!!! In stitches is a great set. It will be fun to play with. I especially loved Erin’s modern card. This set has a lot of possibilities. Beautiful projects. Love the stitch theme. The stitching themed cards look wonderful! Beautiful! So many possibilities. I especially love the banner. Lovely, all the hand crafters will be scooping these up! 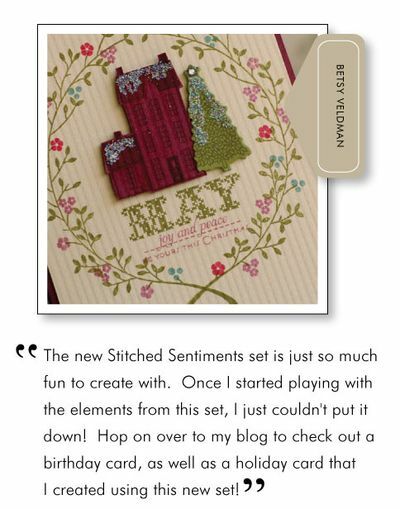 OMG – I love everything about the new stitched sentiments set!! These cards are so pretty. You can feel how heartfelt they are. I used to do so much counted cross stitch, today’s projects are making me want to dig my old stitching projects out and finish (!) some of them! Love the look and “feel” to everyone’s work, especially using that super cute embroidery hoop. Love the Aida impression plate! 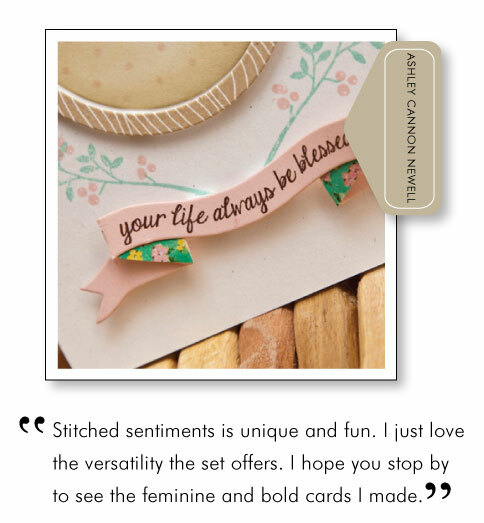 You went above and beyond with all the important little detais with Stitched Sentiments! Fabulous banner – love the stamped details peeking through – and the cross stitch sets are beautiful! Amazing cards from DT. The stitched sentiments set is so cute. Love it! Gorgeous! Can’t wait to see what the DT has made as well! Amazing cards and projects!!! I’m in love with the stitching look!!! The banner is a must have! The banner is my favourite!!!! Love all the projects, girls!!! You’ve done an amazing job!!! Love the banner and the cross-stitch! Many, many possibilities. Yeah from a xstitch fanatic! Wow, this is such an exciting release!!! Possibly the one I’m the most excited about! I was very much into cross stitching before I discovered stamping, and I still stitch whenever I’m sitting in front of the TV, so I think this set is absolutely lovely!! Love that great banner die, too – how perfect that it folds like that!! I love the Stitched Sentiment set…the leafy branch is so pretty!! Very cute sets! Thanks for a chance to in! Absolutely beautiful! I especially love the hoop, it looks so real! I just love anything that has to do with embroidery & crochet. These stitched sentiments take me way back! Great job! Beautiful! Just like my Mom’s!! wow, those looks like real. Really gorgeous cards. Let me first say that today’s creations look like they’ve actually been cross-stitched vs. stamped. Such a fabulous job on this set and the coordinating dies. The aida impression plate really adds a lot to the finished cards…just like my old cross-stitched projects. Great job as usual. I just love the “folk art” feel to this new set! so cute, and it really reminds me of my grandmother. Great memories of watching her embroider and quilt! What beautiful cards, I just love the new release!! I love the sweet sentiments that go along with these new sets! So creatively showcased! I’m loving all the stitchery related stamps and dies! I love that banner die! Wow those cards are just beautiful! I really love the stitched release. You gals are amazing! Love the new set and dies and all your projects! Looks like a very versatile set and the results are warm and cozy! Such pretty cards,TFS. Love the new banner ribbon die! I love to cross stitch. I love stitchery and am so happy you came up with beautiful stamps to showcase it. this new set is amazing. i haven’t done counted cross stitch in awhile. but i still love the look. also, the aida impression plate is genius. thanks. Wonderful new things for stitchers! Love what the design team did with them! How wonderfully old fashioned! Wow! Brilliant! Projects are super cute. This is a MUST have set. TFS. So excited about Stitched Sentiments! It is so LOVELY!! 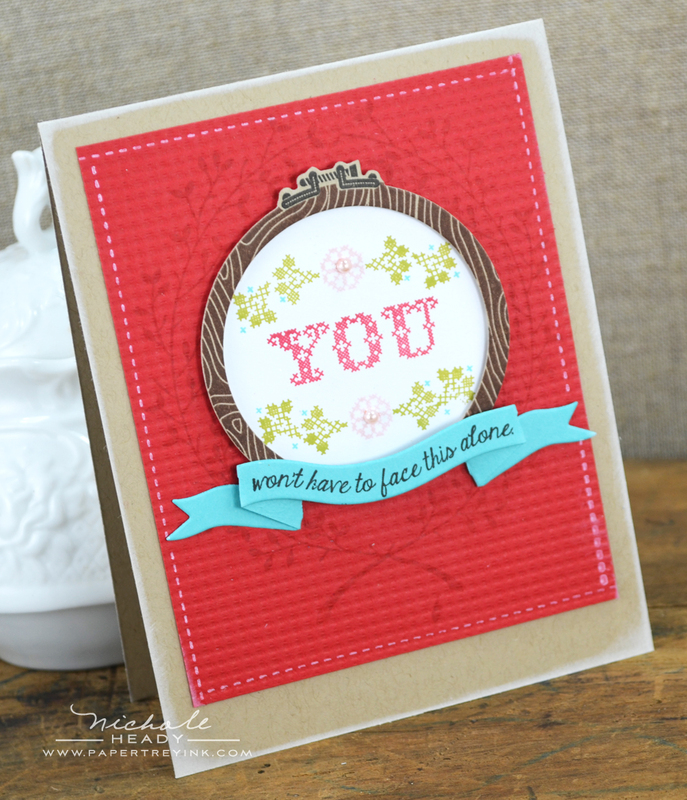 Great card ideas with the stitched sentiments! Love the banner die. So pretty! As an Avid cross stitcher I love all the new stamps and accessories being released this month! How creative is that banner? Love the Aida cloth impression plate also. So fun! My favorite is the adorable banner that goes with the stitched sentiments set….so cute! Love what the DT did with this new stamp set! ……….really lovin’ the projects from the Design Team today. The banner die is so neat ……will love using this on all kinds of projects……cards and scrapbook pages! These are beautiful stamps and I love how they all work together. I especially love the banner die cut! Your first card is my favorite and so lovely. Ladies you have all truly outdone yourselves…great new set, beautiful inspiration! Sooo cool. One of the best designs ever! Lov everything showcased today! I want EVRYTHING that has been showcased so far! There is so much versatility to these new releases! My mom and my grandmother are cross-stitchers and sewers, so these products would be perfect for papercrafts I make for them. I love how real the stamps look! Great sets today! Looking forward to the release! I love the Stiched banner die! That is great!!! So many ideas for that one!!! I am so happy to see the cross-stitch stamp set and dies. I was an avid counted cross-stitcher for many years, even owning a retail store! I haven’t cross-stitched in many years, what with all of the paper crafting I enjoy, which is also much easier on these aging(gasp!) eyes! Love the winter house stamp! What an inspiring day! Makes me want to do a little sewing! Cross-stitch is my other go-to crafty outlet…thanks for bringing my two favorite things together!! I am once again amazed at how you are able to capture love in photopolymer acrylic. Really love the new Stitched Sentiments. Lots of possibilities with this sets. Thank you for showcasing and giving us lots of ideas. Great samples from the DT =) TFS! 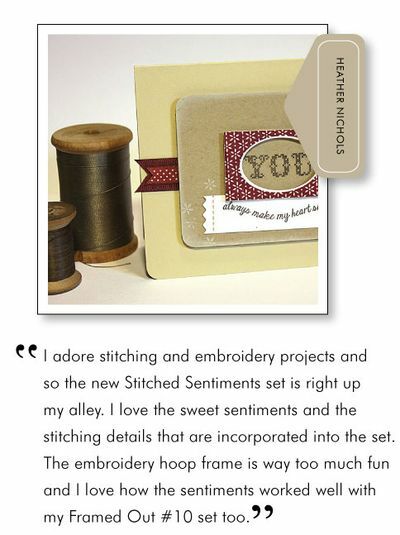 Stitched Sentiments is such a departure from what I am normally drawn to, but you have pulled it off – I’m hooked! Brings back memories of my counted cross stitch projects of the past and makes me long to stitch yet another folk art Santa Claus! The banner is adorable. What a great design team post. Such beautiful projects from everyone! Sweet cards, I like the vintage feel of this stamp set. Love the new impression plate! Will add the perfect finish to anyone’s project! I love it. I ‘m a sewer from way back & this release is so much fun. This set is a must have! My family is full of quilters and stitchers so the possibilities are endless. Just love embroidery work! I have done a bit myself and actually have one hanging in my living room. I also have a daughter who does beautiful embroidery work and hope that I receive this set in time to make her a birthday card using this new set which is the beginning if next month. Just Love all of the samples today and there is always so much inspiration to be had From the DT. Oooo…my kind of embroidery! I love the sentiments, the dies, the stamps..the whole deal! : ) And I love the softness the images create and pretty details. I love, love, love the stitched collection! I used to stitch when I was adolescent, and having this opportunity to have stitching patterns in paper crafting is totally awesome! Thank you for inspriation! Love the banner! Can see myself incorporating it into EVERY card I make! So, so many ideas are flowing! Love it! That hoop is darling, but I really love the aida impression plate! So cool! The Aida impression plate is gorgeous! Love it! The projects are stunning. i absolutely love the banner! easy to use and beautiful whatever you do to it! Love the Aida Impression plate! Love the Stitched Sentiments and the Banner. Oh my goodness, I used to love to cross stitch. I did a lot of it when I first got married and and I stitched pictures of my nursery, this set brings back those memories! Love that banner. So many possibilities. This collection just keeps getting better every day! I can see so many possibilities, can’t wait! Today’s projects are really beautiful. Simply fabulous projects. These dies and stamps are definitely on my list. The possibilities seem endless. What a great impression plate to go with all the stitching products! 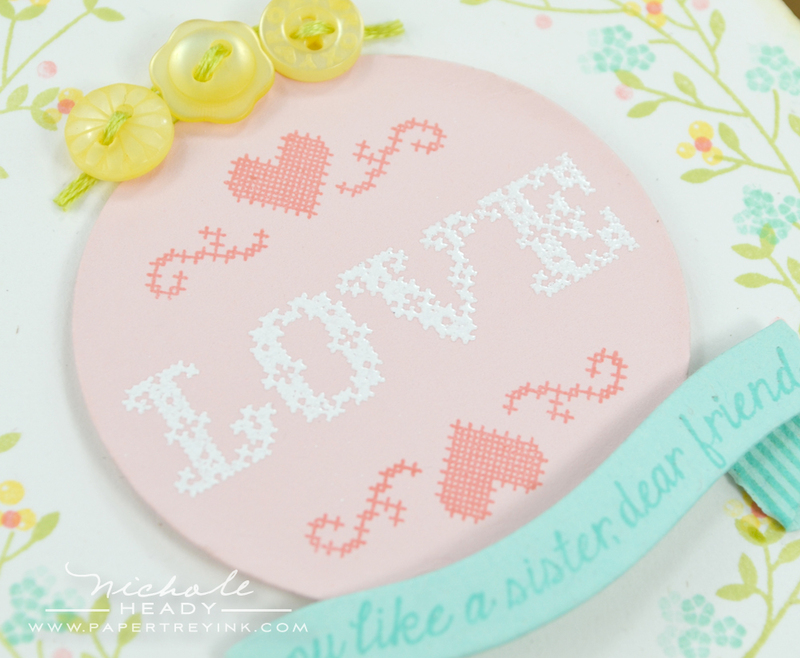 I LOVE the embroidery hoop image and matching die! Such a neat idea… also love the stitched images. So pretty and crafty! Fabulous sample cards. I used to be in a cross stitching group. That was before I discovered stamping! This release takes me back to those days. Love the hoop and banner. Love the aida cloth IP. And betsy’s Christmas card is to die for. Curses, Betsy, you got me again! What beautiful cards! These new products are gorgeous and will come in handy for so many situations. All of these things coordinate so beautifully. The aida embossing folder is just perfect for these projects. 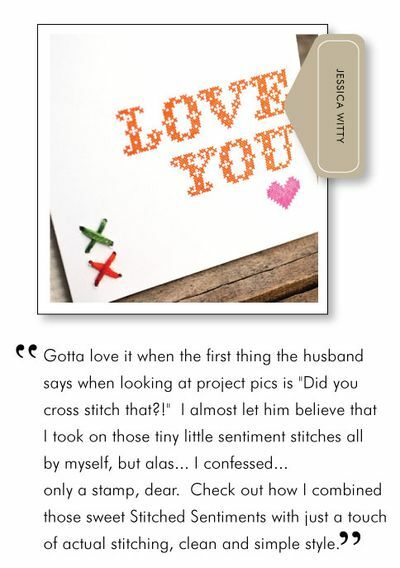 What lovely images from Stitched Sentiments. The sample cards and projects from you and the DT are so very beautiful. 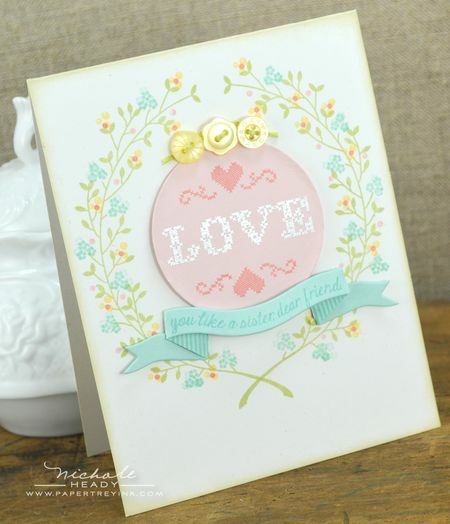 Love the feminine creations these new stamps and dies will create! What a charming set. I especially love the way you worked out the banner. It’s those little things that keep me coming back to Papertrey. I used to cross stitch all the time, not sure why I don’t anymore. Stitched Sentiments is wonderful and I think the Aida impression plate will be one of my favorites. I love that banner! Can’t wait to use it to highlight my sentiments. I love stitched images! Your first LOVE card sold me on this set! I am very excited for this set and dies! I’m really loving the vintage feel of this month’s release! And the realism of Stitched Sentiments is amazing. Thanks for sharing all your beautiful ideas. Love the banner. Can’t wait to order. This is such a realistic set. Love the detail and thought you’ve put into it. Great samples. This set and all your samples are pure sweetness – LOVE !! And I really need that banner die – I’ve been wanting one just like this forever! Oh my goodness these are awesome! My mom is into cross stitching BIG time, she will love all of this fabulous goodness. And the Aida Impression Plate, fantastic idea! What a cute stamp set! I’m loving the look of the Aida Impression Plate. Love the stitching theme-especially the hoop and sentiments! makes me want to get back into cross-stitching! Wow – this set & matching dies are going straight to the top of my wish-list. Cross stitch was my first crafty love, long before I discovered stamping & paper-craft, & this set really combines these crafty passions so well. And the Aida impression plate is fabulous! Love the samples from the DT! Wow! 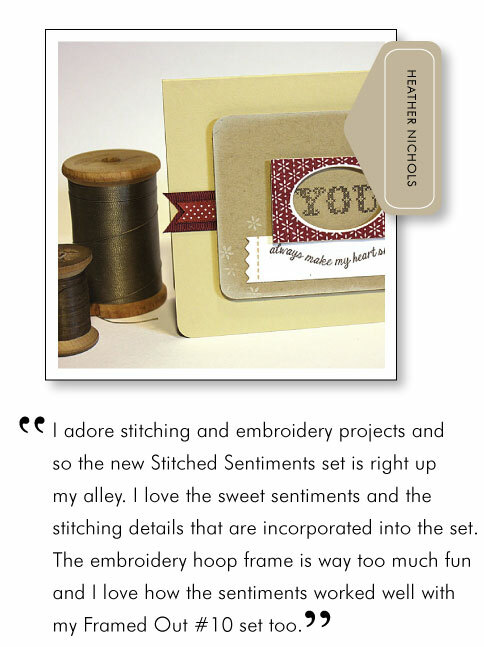 The In Stitches sentiment banner is gorgeous – love the ‘movement’ of it! I don’t think that there was a relative of mine that didn’t stitch…including my dad! He cross stitched my mom and my sister’s Ukrainian blouses! The inside of his stitching was just as neat as the outside! OOOH, how pretty…I like the ribbon die very nice. WOW another crafty related release….loving that!!! That banner is GORGEOUS too! Thanks for the wonderful insiration with your creations!!! Loving the embroidery look! This reminds me of my cousin who cross stitched a lot when we visited her. Thanks for sharing! I really love that vine stamp! Love the stitched look and the banner die is awesome also. Thanks for always providing such beautiful products and projects! I love all these x-stitch projects! All so pretty. Beautiful projects. Love all the soft colors. Oh gosh, my list is getting longer and longer and it isn’t even the last day yet, hi hi. These new stamps are absolutely amazing! So many new design options! Love the inspiration from the team!! The “Stitched Sentiments” are so pretty! WOW! I can’t wait to see this whole set! This set makes these projects look so life-like—as if they really were stitched! 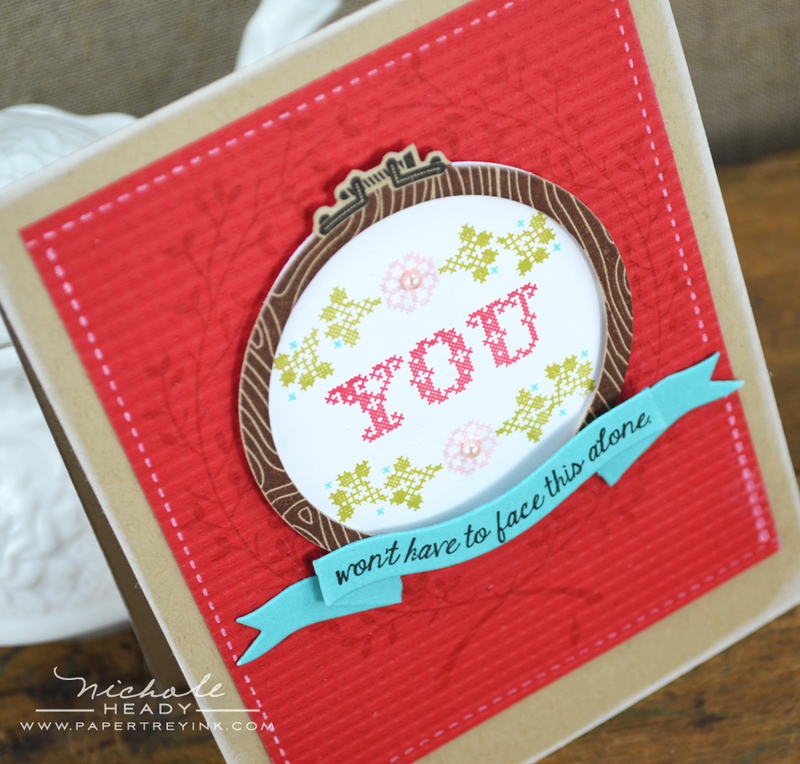 I especially love the woodgrain stamp used on the hoop–inspired! Love the Stitched Sentiments sets. Enjoyed seeing the versitility of it from the DT. Great projects! Love the shape of the new banner! I used to cross-stitch all the time and so did my mom and grandmother. Such a cute set that brings back so many memories. I can see so many uses for the impression plate, it could make any image look like cross-stitch. My mother-in-law taught me to cross stitch years ago. This set reminds me of so many loved ones who were so creative. It’s a definite must have. Thanks so much. Beautiful….reminds me of my childhood with Grandma! This all brings me back to my childhood, watching my mother and grandmother sew and cross stitch. These new products will be great for their cards. I love it all! Oh my gosh this set is so lovely and elegant. Great job! Fantastic! Can’t get over Erin Lincoln’s card – love it! Oh how fun! The stitching theme is soo adorable! The DT really showcased it too! I haven’t cross-stitched in such a long time but this brings back wonderful memories. What a great idea to stamp a wood grain background on the embroidery hoop!!! Love the new Aida Cloth IP! So much lovely texture in it:) Cross stitching reminds me of my Great Aunt and all of the beautiful things she has made for me over the years! I used to cross stitch and love the look. Your stamps and die cuts are delightful. Yours and the design teams ideas to use them are very inspiring. Can’t wait. This cards look so crafty 🙂 Adorable! Such a fun banner! Am loving the creativity! How CUTE!! I LOVE the stitched sentiment set and the die. The projects are just stunning!! Beautiful way to combine my love for cross-stitch and card making with this set! Lovely work, ladies!!! O my stars!!! I love, love, love the stitched sentiments set and dies!! I don’t know what is more exciting, all the possibilities with the stamps and dies, or the fact that stitching stamps are a theme I have been looking for ALL over and now I have found!!! Beautiful stamp sets! And that banner die is so versatile! I can’t wait to use the cross-stitch stamps and hand embroider some cards! Lovely new set today and the DT has made such great projects. Thanks for the chance once again. Counted cross-stitch is one of my favorite crafts, but it is time-consuming. This new set should give us the look, but with only a fraction of the time. What’s not to like? I love the banner die, too! What pretty projects today! And I love the mix from the DT, some CAS, some all homespun-y. That banner is to die for! Another dy of wonderful projects! Beautiful cards! I love the aida impression plate. You have done it again, so many great combinations, I can’t decide which I like best! The talented DT ladies do it again–create incredible little works of art that make me want it all! Beautiful cards today! Very cute set and idea! Love the new banner, what could be easier. Also loving the new impression plate – it looks so real!! Love love love the stitched sentiment set! Just my style….. I am really liking the banner die! Looking forward to seeing everything revealed! Love the In Stitches dies and Stitched Sentiments. It reminds me of when I was young and did cross stitch. OMGosh, these are all gorgeous! LOVE your stitching theme! Excellent! So many stampers also sew, needlepoint or embroider, or have friends who do, this set is perfect! Love all the stitched sentiments! I haven’t stitched in a while, even though I still have drawers full of charts and yards of linen fabric. Wonder why I suddenly feel the urge to go dig it out? Thanks for all the inspiration today, and for the chance to win a great gift certificate! My mother and both of my grandmothers embroidered projects! My mother still does and her baby quilts are prized!! I love the warm feeling I get when I look at these sets. It feels so personal! The folded banner die looks so useful! Great projects! I used to do counted cross stitch all the time. Very nice cards and I love the banner die. Great release for all the stitchers and knitters. Really cute products. This is the set I have been dying to see since the sneaks, and I’m thrilled. Love this set, and an impression plate too! Woo! Homespun goodness with wonderful memories of creating that special item as a child! Thanks for sharing gorgeous projects! Exciting release! I am not a sewer but I love how this stamp has so many possibilities…love the wreath! Wow this is beautiful! This brings back memories when my mom used to sit in her favorite chair and cross-stitch while I fool around with the floss! Wow! I love this! This brings back memories when my mom used to sit in her favorite chair and cross stitch while I fool around with the floss! This is my absolute favorite set from this month’s release to date. Just love the sentiments and the stitched look. The first craft I started with was cross stitching although I don’t do them now. Love the softness and color schemes of the projects featured. The impression plate is gonna be another favorite of mine. this brings back so many memories of my grandmas and my mom! Thanks! Love the In Stitches die. That first card is absolutely divine! I love the soft pastels used with this set. Really brings a soft country feel to the card, with real meaning. Gorgeous! That banner die is genius – you get such a lovely result for so little effort! Love the woodgrain hoop stamp! Great samples here and from the design team. Thanks for the inspiration. Very cute! The cross stitching really does look real. It is fabulous! Oh My Goodness! Absolutely LOVE this theme! 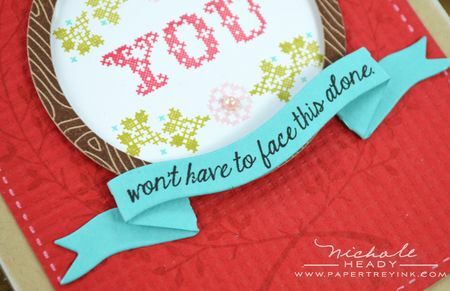 Love the stiched sentiments and the aid impression plate. There are soo many possibilities!! I adore today’s products and projects!!! I have done cross stitching in the past and although I enjoyed it , it was very tedious! Stamping has been my “addiction of choice” (lol) for 9 years now and these look like such fun to create with! What a fun and interesting set! Reminds me of all the cross stitching my grandmother used to do. I love the cross stitch set. I spent many hours as a child cross stitching. I just love Design Team Genius Day, never disappointed, thank you. I do counted cross stitch also so loving all the stitching. That banner is adorable. And can we talk about the aida impression plate? love it! Beautiful! I love the look of the new banner die. I can’t stop looking at these projects!!! The cross stitching stamps are simply amazing. My mom cross stitches and I would LOVE to make some things for her using this set! love the modern stitched sentiments. Wow – so beautiful & with the dies & impression plates you have made it so easy to get the perfect stitched loook – amazing! I love the banner die! So clever! The sentiment set is so nice. I love the samples. Thanks for sharing! I’m a cross-stitcher so these products are right up my alley! So cute and homemade. Can’t wait to buy them! The cross stitch theme reminds me of my grandmother, she taught me how when I was in elementary school. Such great sets to create a stitched look with ink! Awesome samples today everybody!!! Love, love, love that banner die and the impression plates will be very cool too! Used to do cross stitch in college. 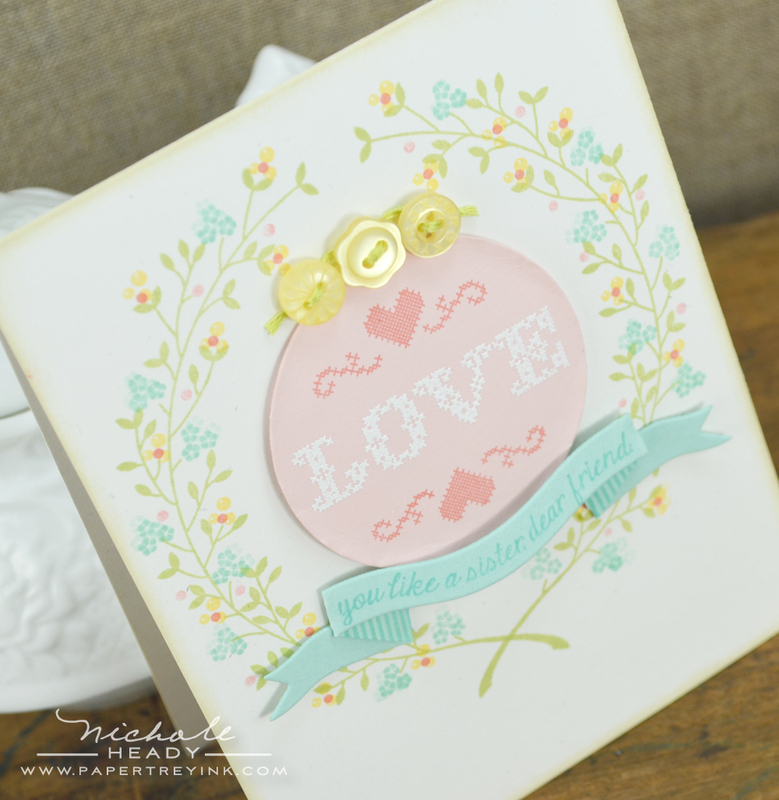 Love that soft and pretty LOVE… card of Nichole’s. Another fabulous count down. Love all the new products. The cross stitch reminds me of my dear, much loved Grandmother. Always love your new creative ideas!!! Very cute projects and what a fun set! That banner is so cool too! Lovely projects with these sweet new stamp sets. I was a cross-stitcher many years before becoming a stamper. What a nice blend you have offered today! I love this look! My mother made me a cross-stitch ornament every year for Christmas when I was growing up. Whenever I see cross-stitch items, i think fondly of the time she spent working on them while we sat together. What a neat concept for a stamp set! I love this set and me being a seamstress for 40+ years makes it even more special. Thank you so much. Can’t x-stitch anymore – 2 hand surgeries – so this is the next best thing. Can’t wait to order these. Nichole…gotta say I think this is the best thing you have ever designed! Love the banner, the Aida impression plate and all the cards displayed today. Thanks for sharing. I just think you designers have outdone yourselves! Really love the stitched sentiments and dies! I love these! Tha banner is great. I have a cross stitch project from 1990 I still haven’t finished. Don’t even see the person I was making it for anymore. I think I’ll do better with stamps. Wow! I can’t wait to see more of this set! I love the words you chose to enlarge and that little banner die is perfect! He! Easy than stiching! Nice! 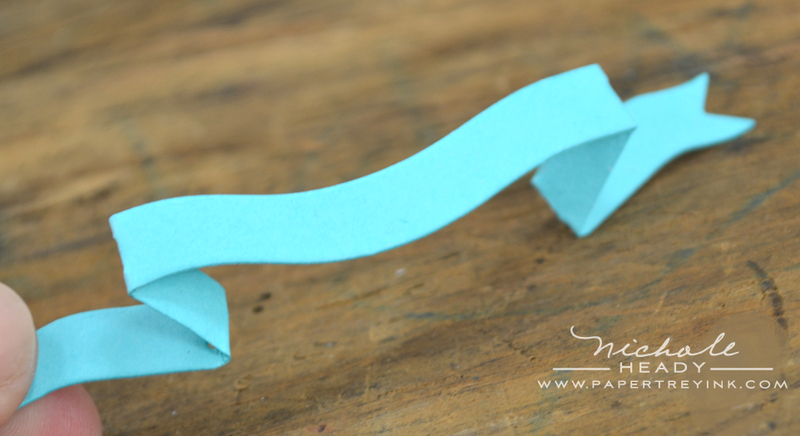 I love the way the sets and dies work together this month – awesome! So many possibilities! I just adore the little banner – wow have you created a totally awesome tools to make cards really special. I am loving the stitching theme this month. I haven’t cross stitched in a while, but at least I can get the theme across in my cards. Can’t wait to see more. Love this new banner die! Beautiful projects–it really does look like real stitches! I think these sets are a little too vintagey for me, but it’s still so interesting to look at all the blog posts and see what everyone comes up with. That banner die is pretty awesome. This is a great set!! I used to cross stitch and this set inspired me to start again. Mu mother still have all the wall art I made her. Thanks for the chance to win!! Love the banner die! Your first project is just beautiful Nichole! Can’t wait to order on release night! Love the banner! Another great month. The PTI designers are the BEST! and I can see all the fun to be had! There are so many wonderful women in my life who I would love to create some “Just Because” cards for, using the Stitched Sentiments stamps, dies, etc that you’ve shown us today. I love the realism that you’ve been able to create, and can’t wait to get my hands on all those supplies! The new banner die is a must have on my list. Love the stitched look –will certainly open up new possibilities! Love the banner too! LOVE this! So darling and fun….can’t wait to see everything in this release in full! So many great ideas with the stitching and sewing sets. Love all the cross stitched looking stamps. Having been an avid cross stitcher for many years, this is right up my alley. The banner die is genius…I will need to get that one! I really love all of todays post!! Getting excited for the 15th!! I’m love all of the new goodies!! Every one of the examples from the girls are SO beautiful. Love all the cozy, heartwarming feelings that they send. What a great idea! Oomph! Cross stitch – one of my other favorite fun things to do. Love the set and that sweet banner too! I love cross stitch!! this set is beautiful! I enjoy cross-stitching as well. These will be great to use. This set has really caught my eye. One of the first crafts I selected to do on my own (that is, outside the crafts done in school) was a counted cross stitch package I asked my mom to buy me at a local craft store. What a great way to combine one of my first craft loves to my current one! WOW!Great new set and dies!! Beautiful new products and cards! Love that banner so much! I love those cards that look stitched! So cool. The banner is so pretty too. Love the new Stitched Sentiments set, and Erin’s rainbow card. Great projects. I love the stitching sentiments. So many great possibilities. Absolutely ADORABLE!!! I am so in love with the cross stitching set!! And the impression plate…..*sigh*. SO cute!! The banner is great! So vintage style! I really like it! Wow, this is my favorite set you’ve shown so far. I love the embroidery hoop and coordinating wreath and banner. Love the stiched sentiments! A must have, for sure! Such an innovative banner die, and all these products are great! I ONCE WAS A CROSS STICHER SO I REALLY LOVE EVERYTHING I SAW TODAY. I absolutely love the look of the stitched sentiments! It gives these projects such a homespun touch – just so pretty! This set is amazing! I love the coordinating impression plates, too. Wow! Gorgeous projects! I love to hand sew on my cards and scrapbook pages because I love the homespun feel that it adds. This new stamp set just warms my heart! I remember when I was a girl one of the first things that I learned was cross stitching and I still love using a needle and thread to create with! Thanks for these wonderful new products and everyone’s inspiring projects! The banner is really great. All the cards are ‘sew’ sweet!!! So clever to do the background stamp like cross stitch cloth. What a wonderful collection. 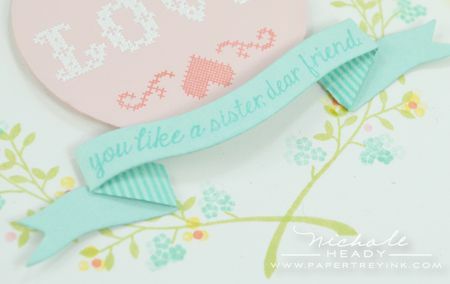 The new stitched sentiments are so sweet and love the banner and hoop dies! love this homespun set, it’s adorable! Love the stitching theme! Super great projects! Love all the needle art stamps and dies! A very fun release! I’m loving the stitching theme this month. Can’t wait for the full reveal. I still have some beautiful cross stitched scenes of children by the sea, that I hope to save for my children someday. 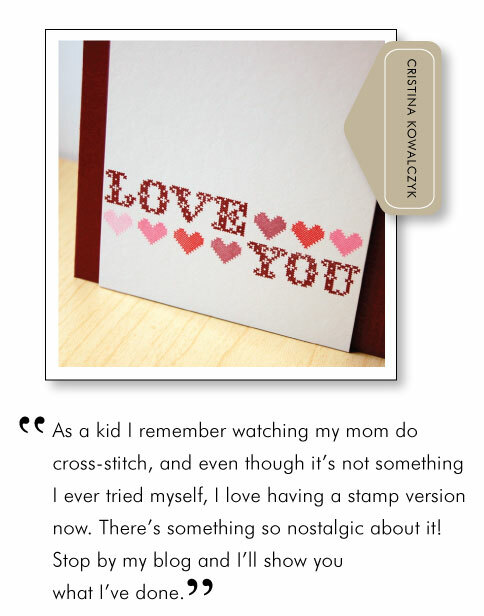 your new stitching stamps bring back sweet memories. Absolutely beautiful!! Love this month’s release!! The projects are gorgeous today. Love the stitched sentiments and for sure the banner die!!! Love the Stitched Sentiments set. I couldn’t help but think of the hours my mother and I spent doing needlework. Such fond memories. I just love the stitched sentiments – and I can see so many uses for the banner die. This set is so sweet and reminds me of a simpler life. The vines are wonderful! Love you ‘Love you like a sister’ card. Everything is so beautiful! Thanks for the chance to win! I do counted cross stitch myself and LOVE this set!! Can’t wait to put some stamped canvas through that hoop!!! I was thrilled to see this set. I’ve been anxiously waiting for it all release. It was the first set to catch my eye during sneak peeks. My mother taught me to cross stitch years ago and it’s still one of my favorite relaxing, past times (after paper crafting, of course!) Many of the Christmas gifts that I’m giving this year are hand stitched. This set would make perfect gift tags! Adorable projects! LOVE the new banner die! Fabulous detailing!! Just love all the stitching products! Very impressive samples! I love the banner die and how easy it will be to fold. These sets bring back memories of doing lots of counted cross stitch projects. I absolutely love, love love the stitched sentiments stamp set and all the wonderful projects that were created with it. I absolutely love this stitching set, a definite must have. Wow, the stitched theme for this month’s release is simply fabulous. I love what Nichole and the other designers have done with these wonderful sets. I love Stitched Sentiments – would make great cards for my friends! Oh… my… goodness! I taught my husband to cross stitch many, many years ago. And he became better at it than I. I remember coming home from work one evening after he had been out of work for a few days with a bout of back trouble. He had cross-stitched the cutest little pic of a pig and a skunk (not sure if I was the pig or the skunk – lol). And the cross-stitched Christmas ornaments he made for me that are framed with those little embroidery hoops – oh, what treasures, especially now. What a truly wonderful release! I like that banner die for various uses – I’ve thought to myself that having one of those would be handy sometimes! Love these- I especially love the way the impression plates come out- so awesome! Wow, what amazing projects! I love needlecrafts as well as papercrafts, so I have been really enjoying everything this month. Can’t wait to see tomorrow! What a great set! And love the new banner and impression plate to match! Oh my goodness! Everything crosstitch looks so real! I think it would be fun to use these on fabric to do the actual crosstitching of the sentiments or images! I love everyone’s samples and hard work for our enjoyment! I have to admit to being quite partial to hand stitching on cards, and this certainly takes the time consuming work out of it! Loving the handcrafts theme this month. I used to do a lot of cross stitch in my day. Love the look in stamping and the aida cloth impression plate is cool. I am a real lover of embroidery, so this stuff is fabulous! What a great release. I love the little banner that goes under the stitched designs! So creative. Fantastic release for my stitchy friends. And the banner die cut is amazing. Just the thing to “finish” a card. I have always loved cross stitch, these stamps and dies look like fun! I love the new banner die….just wish it was separate from the “set”! Great projects and very creative ideas! the ribbon banner in the stitches die set is wonderful! I can see so many uses for that! love the 3-d design of the new banner! great release this month! i haven’t cross-stitched in ages! this brings back so many great memories. can’t wait to use this stamp set! What will you think of next? Love the stitching set and adorable embroidery hoop – with matching dies too!! This is one awesome release month!! Amazing projects and such a wonderful new set and dies. The creativity never ceases to amaze and interest me! Clever banner die. Thanks for all of the inspiration and the chance to win! Such beautiful projects! I really like the floral wreath! so many creative projects! love the vines, the pretty sentiments, and the fun banner die! love the stitched designs the aida impression plate and the ribbon banner. all very nice! Today’s preview is my favorite so far! I LOVE the Aida cloth impression plate!! I like this month’s stitching theme. Today’s projects look great. Super adorable new images. I especially love the floral circular frame image. I love the banner die! I love cross stitching and these cards! Cannot wait to order the stamps & dies! Oh my! I love it all. I was a cross-sticher before I got into stamping. My sister is still a die hard stitched. This release is just perfect. The aida impression plates are a genious idea to pair up with this set!! Brings back old memories…should break out the floss! I used to cross-stitch so I am really impressed with the realistic texture of the impression plate. That banner die is so realistic. My favorite product in today’s post! Gorgeous cards and projects ladies, can’t wait to see what you created for the rest of the release! Thanks for sharing and the chance to win! Love, love, love the stitched stamp set! Can’t wait to add it to my collection! Melissa Phillips really summed up my feelings for this stamp set! Just this weekend, I went to a bridal shower where for my gift, I stitched the bride and groom’s names along with their wedding date on osnaburg fabric in their wedding colors (Etsy sells these for $ 120!) and an ornament with their initials as their wedding date is days away from Christmas. Making cards and homemade gifts are very important to me. Many people ask me how I have the time to make something. I make the time! Thanks for the opportunity to win! I love the banner die and the Aida impression plate! Super cute! So, so, so in love with this release. So much potential for coordinating with homemade gifts. 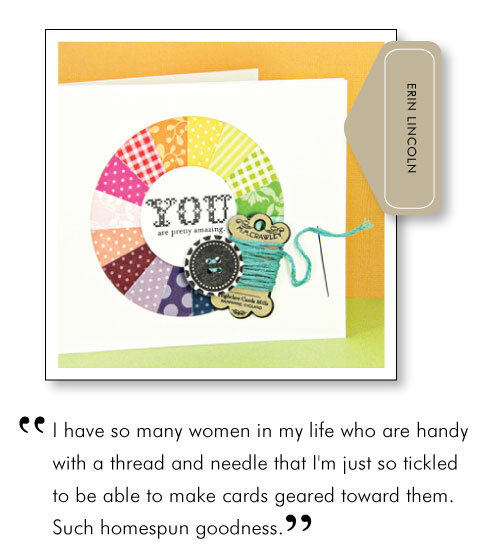 Your “needle work” collection is adorable and the cards you made so inspiring. Love them! Thanls. Wow! As a cross stitcher myself, of course 8 love today’s releases! The little banner die will be fabulous!! !I can see it making a nice card great.It will add just that little bit of style. My wife will love these…. Love the banner – very flexible. Lovely cross stitching stamps. Not really my style but I like the projects done! I am a cross-stitcher, among many things, and this release brings back so many memories of times spent gazing at vintage samplers and lovingly making my own treasures. Beautiful samples! I love the new Aida Impression plate! Also Jessica’s idea of adding actual stitches to the card. Thanks so much for all your ideas! Counted cross stitch was my first craft love and it just makes me smile to see the lovely images you’ve created – a delightful idea! The vine is so pretty!! And that Aida EP **swoon**. Te cross stitching projects are just wonderful. I did cross stitching for years, and then I found paper crafts. That was the end of my cross stitching hobby. The hoop is a cute idea and the banner die is great. I love the stamps and dies featured today!! Wonderful inspiration as always. I love all the fabric craft themed stamps! Cross stitching was the first craft I ever learned to do, so this set is special to me 🙂 Love it! Love the Stitched Sentiments collection! A must for my two sisters who love cross stitching! What a lovely set and love that banner die! This is my favorite of all the new releases! It brings such fond memories back! You and the design team have done a wonderful job showcasing today’s release. These are great! I know my mom will love a card with one of the stitched sentiments. I can’t wait! Such inspiring samples by the design team!!! 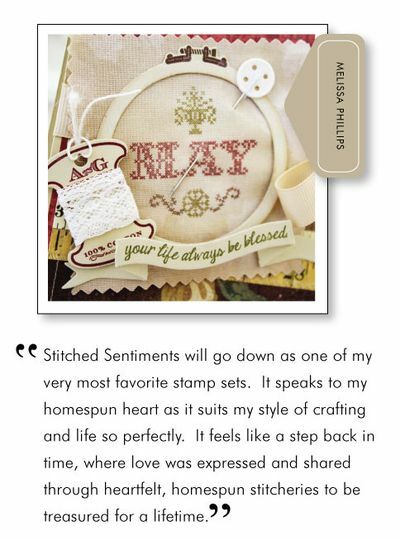 Pitter Patter goes my heart…I just love the Stitched Sentiments. Thank you for the inspiration ladies! Loved everyone’s cards using the Stitched Sentiments set-lovely! PS I love the aida plate ! What a fun set! My g’ma taught me how to embroider and this brings back so many wonderful memories. This stamp set reminds me of time spent with my grandmother when I was young and we crafted together. Love the In stitches dies! Oh my heck, I’m dying with excitement over today’s posts! My Grandma has been an avid knitter all her life, making the most beautiful sweaters and afghans. She’s 95 years old now and in a nursing home. I am squealing with excitement to make cards for her with these goodies, she looks forward to mail delivery every day and I try to send her cards a few time a week. I know she’ll love the cards made with these to pieces! It’s hard to believe that these stamps make the stitching look so real!! All are simply gorgeous! What a great way to combine my love of stitchery with papercrafting! I can see the banner being very versatile too! The sentiments on the new knitting stamp set are adorable and I must have the sweater die! Everything is simple, yet beautiful. These are great! I am loving the theme!! What adorable sets!! I love them! I’ve been teaching my young little girl how to “stitch”. These are perfect to make with gifts! WOW! So many lovely things from the Design Team! Love the stitched theme! Oh the banner I like very much. So useful. Great group posts today! Such great sets and lots of awesome inspiration! More great stamps and dies today! Lots and lots of possibilities! Great samples by everyone! I am always amazed by your creativity!! So inspiring!! It looks like another great month of products. great work.. please keep it up..
card are best option for say something to someone special and you made such a great cards…. Bloggers like you are very few on World Wide Web and I am happy to found you. It’s like finding a pearl in the sea, tough but fruitful. Best wishes and regards. I have always loved doing stitching and embroidery projects and so the images and sentiments in the set are right up my alley.